Thai people are so lucky that they can taste a great variety of foods mixed up with herbal plants that bring them to be well know all over the world like "Tom-Yam-Goong" Thai foods are also believed to be medicinal in themselves with sweet scent permeated from herbal plants after being cooked. We try to keep the information without any adaptation from the olden days especially when it comes to the procedure of preparation and traditional cuisine. You can be sure that you would get the right information from many experts in the field. With our careful effort in carrying out the whole precess including photography and art work, we are hopeful that you will find the blog satisfactory and worthwhile. We further believe that it should be a treasure for Thais and foreigners who are enthusiastic about the art of cuisine. 1. Crush slightly chilies and garlic. 2. Add green beans, plump tomato, and peanut and crush them until well mixed. 3. Taste by plam sugar, lemon juice, fish sauce. 4. 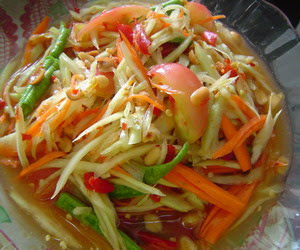 Add papaya, dried shrimp and crush them until well mixed. Remove to the plate for serve. Sprinkle with peanut. I need to start eating healthier. This is the perfect recipe to make that happen!